Lisa performed on Show 309, recorded in Vail, CO, on July 9, 2015, at age 17. 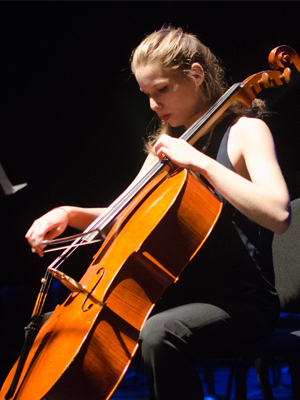 Lisa Strauss (cello), 17, began her musical studies at the age of 5 and began playing the cello at the age of 8. In 2008, she entered Annie Cochet’s class at the Conservatoire à Rayonnement Régional (CRR) de Paris and then studied with Hélène Dautry for six years. At the age of 12, she received second prize in the VioloncellenSeine competition in the 12–15 year-old division. She has participated in numerous masterclasses with masters such as Richard Aaron, Johannes Moser, Michel Strauss, and Roman Borys, among others. At age 16, she received her end-of-studies diploma unanimously from the CRR de Paris, and in February 2015 she was admitted unanimously to the Conservatoire National Supérieur de Musique de Paris.